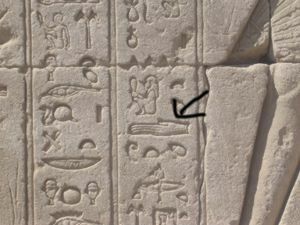 This hieroglyph of a head, is clearly not a human head. 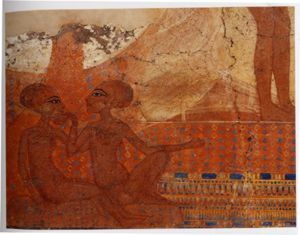 Why would these ancients portray all kinds of alien heads and bodies all over the place. The only logical reason is that they saw them, they existed. These ancients were not a crazy religious cult as Egyptologists portray them. They were spoken of by Hermes as being the happies and healthiest people in the land. A healthy mind does not go to such mind boggling lengths as these to carve gigantic monuments and carvings in stone with no logical reason. These people were not crazy. They were from another planet. Here is a picture of a figure with a long neck and strange head. While not resembling some of the other aliens, he does not look entirely human. Here we see a hieroglyph of a hand which clearly has much longer fingers than a normal hand would have. Why would they go to such trouble to carve this hand. I think it is to say yoooo hoooo look at this hand it is not human. This is who we are!!!! It is like when you are a kid and you go by freshly put cement on the road, you instinctively want to put your hand or footprint in the cement. This is the same, it is a calling card. It is a signature. 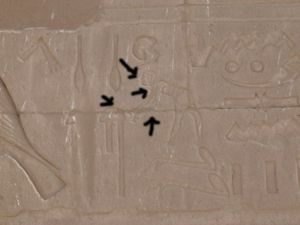 It is not a symbol representative of something else such as a word, or some other nonsense Egyptologists would have us believe. 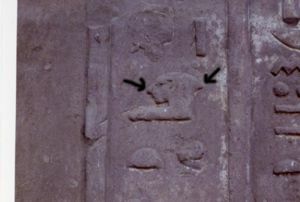 In this picture we see 2 heads of what are supposedly Egyptian Gods of the Amarna Period. Notice the first face, his eyes are a little larger than our's and his lips are african almost. As many other of the so called Egyptians are not like his. Some of the figures look white or like Americans almost. It just doesn't add up, when you compare the profiles of many of the Egyptians painted and carved on walls and immortalized in statues you notice too many anomolies. Notice also the necks of both individuals. Their necks are long and slender, indicative of an alien race, as our own necks are not like these.